After more than two decades in the broadcast production field, Avid continues its commitment to powering cutting-edge tools with sophisticated virtual studio, augmented reality, tracking and video wall control solutions. Avid’s Maestro | Virtual Set is a comprehensive, cost-effective, modular solution that integrates all hardware, software tools and tracking technology a broadcaster needs to produce and control high-end virtual studios and 3D virtual objects with incredible accuracy. The product represents Avid’s longtime approach of building holistic virtual studio systems. Maestro | Virtual Set is ideal for creating unique studio settings, including showcasing graphics, video and information in more compelling ways. It can be used to add visual impact to elections, sports and entertainment shows, news programs, and other live broadcast productions. “A key benefit of the Maestro | Virtual Set system is unlimited design possibilities. The suite comes with full slate of tools that can be leveraged to create a captivating virtual production,” said Haim Halperin, Avid’s Senior Principal Product Manager, Virtual Studio, AR and Tracking. It enables broadcasters to work with familiar 3D modeling software tools including 3ds Max, Maya, Cinema 4D and more. VRML, COLLADA or FBX formats are used to import 3D models — along with their animations, textures, and materials — and design virtual studio sets would be impossible to build, too complex, or too expensive to manufacture in the real world. RTL with Avid Maestro | Virtual Set. Learn more here. Maestro | Virtual Set offers a fully integrated workflow that can be operated by a single operator, including rundown based and nonlinear production control options. Avid’s Maestro | Virtual Set also seamlessly integrates with major newsroom and automation systems, including Avid’s MediaCentral | Newsroom Management (previously iNews), ENPS, Octopus News, Dalet and Control Air. Maestro | Virtual Set can connect to commonly used automation, traffic and production control systems to enable a complete virtual studio ecosystem. When paired with Avid’s next generation Xync 2.0 infrared tracking system, the system provides unmatched performance and accuracy for live productions. Xync 2.0 is a new and flexible tracking system that combines the reliability, performance and accuracy necessary for live productions. Content producers can freely move a camera anywhere within the virtual or conventional studio without limits — even with multi-camera productions. “The advanced tracking system can also handle the demands of dynamic, eye-catching productions, including low-angle shots, 360-degree pans, jib shots as well as close-ups, crane movement and handheld camera shots with simultaneously zooming in or out,” explained Haim Halperin. Xync 2.0 is agnostic to any type of cameras, lenses, and tripods and can work with any partner product. With only a two-frame delay, any complex virtual studio environment can be filled with 3D virtual objects and video. Avid’s Xync technology processes all tracking information from all camera parameters, including the XYZ position, zoom, tilt, pan, focus, and roll settings. Using a series of sophisticated algorithms, it analyzes the data, determines the value of each variable, and feeds the tracking data directly to the Maestro | Virtual Set or Maestro | AR system, all in real time. Xync 2.0 is the next-gen version of Xync 1.0, which was used by 100’s of leading broadcasters worldwide. Xync 2.0 offers minimum hardware dependencies, higher accuracy and increased reliability making it one of the best-infrared tracking solutions on the market today. In addition to Xync 2.0 integration, Maestro | Virtual Set also works with a myriad of third party tracking systems. Behind the scenes, Maestro | Virtual Set offers unmatched rendering power that enables broadcasters to run multiple virtual sets in real time, maximizing resources while increasing revenue. An HDVG graphics rendering platform supports multiple formats, multiple video insertions and includes an internal video delay as part of the system. In addition to leading virtual studio solutions, Avid also offers a full lineup of augmented reality tools, making it easier than ever to change the look and feel of the studio environment and create compelling augmented reality pieces to elevate production value, better engage viewers and enhance storytelling. Avid’s tools bring a new dimension of interactivity between the presenter and the graphics. 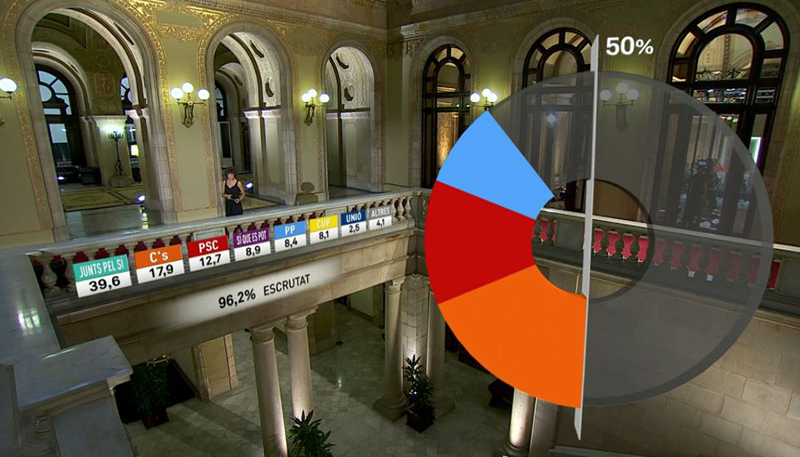 Learn how TV3 uses Avid products for its election coverage. The presenter can display graphics on the screen as well as in the studio, and the graphics can interact with one another, both inside the studio and on the screen. 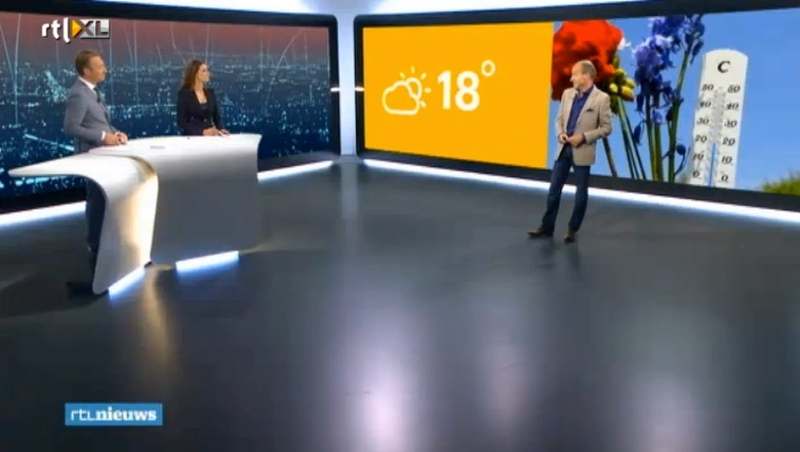 Maestro | AR takes advantage of Avid’s studio and graphics offering enabling broadcasters to maximize return on investment by using the same tools across their production ecosystem and work within a single unified studio workflow environment. Avid’s Maestro | AR can also be used with Avid’s tracking solutions, as well as third-party tracking systems. Its endless creative possibilities provide an effective way to capture your audience’s attention, present content in compelling new ways, and add visual impact to election coverage, sports and entertainment shows, news programs and other live broadcast productions. Maestro | TD Control is Avid’s studio display control and management solution that makes it easy to present, manage, and control rich media — including 3D real-time graphics, video, augmented reality, images, visual effects, and live feeds — across multiple high-resolution studio displays—all from a single touchscreen interface. “Maestro | TD Control makes it easy to entertain and inform audiences while significantly boosting the studio’s ‘wow’ factor, said Daliah Naor, Senior Solutions Marketing Manager for Broadcast and Media at Avid. The solution allows producers and creators to Incorporate real-time 3D graphics, video, augmented reality content, live tickers and other media into the production across an unlimited number of video walls and studio displays — regardless of the aspect ratio, size, shape and resolution. Maestro | TD Control can display content at up to 16 times the size of the HD-SDI video outputs, and up to 8 times the size of the 1080p outputs — key in filling even the biggest video walls. Broadcasters can display SD, HD, Ultra HD, 3G, 4K and other high-resolution formats simultaneously across inputs and outputs or even display 4K clips in their full resolution using four HD-SDI outputs to a video wall. Using Maestro | TD Control’s built-in pixel base router, broadcasters can quickly “slice” and map any high-resolution source, or Maestro | TD Control output, to fit each video wall’s unique size and aspect ratio. Content can be created in the actual aspects and orientation of the display that will present it, making it easier for design teams. With its constant internal two-frame delay on all processing, Maestro | TD Control minimizes delay when interacting with live video sources, enabling the talent in the studio to interact fluidly with any reporter on the scene. In addition to rich video wall content, Maestro | TD Control can control augmented reality graphics placed within the studio set. Its advanced UI tools ensure that graphics interact and maintain perfect sync with the studio display content to convey a unified story. “This enables broadcasters to easily manage and drive both types of content from a single solution, providing a holistic experience for both the user and viewer,” said Daliah Naor. Maestro | TD Control enables broadcasters to generate editorial content directly from their newsroom software, insert it into the Maestro TD Control rundown and trigger it manually or automatically, making it ideal for fast-paced studio news production. 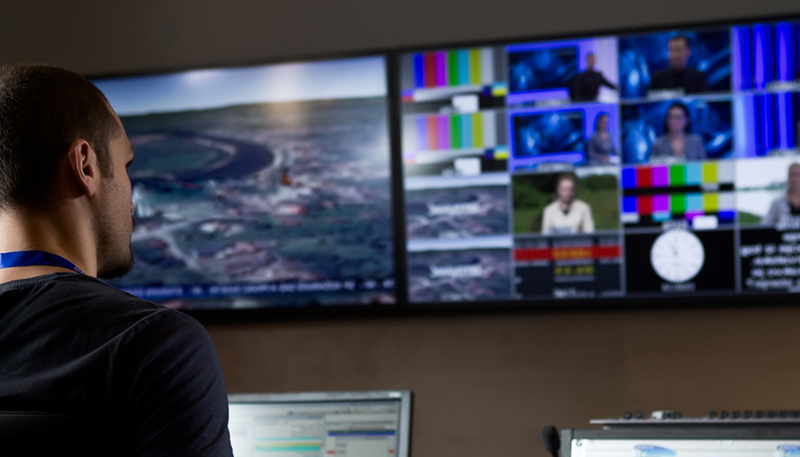 Maestro | TD Control is complete end-to-end solution to streamline production, integrating seamlessly into existing control room workflows and devices. It works with any type of display, including LED, LCD, plasma, rear projection and projector. It supports all major vision mixers and video. Maestro | TD Control offers dynamic program/preview, enabling operators to confidently verify content before it goes on air. This unique feature provides an actual replica of the entire studio’s displays—along with their positions, orientations, and aspect ratios — on a single monitor. Looking toward the future, Avid’s commitment to virtual reality, augmented reality, tracking and advanced video control will continue with upcoming integration with Epic’s Unreal Engine. The next version of Maestro | Virtual Set will combine the extremely high level of photorealism based on Epic Unreal Engine 4 and Maestro | Virtual Set’s accurate data-driven graphics packaged together on a single platform, says Haim Halperin. This new combined offering will allow users to stay directly in the Avid workflow while taking advantage of Unreal’s engine within the same, familiar user interface. Avid will continue its open architecture approach as the backbone of all of its solutions, including Avid’s studio offering which are agnostic to all types of third-party tools and systems. Maestro | Virtual Set, Maestro | AR and Maestro | TD Control all offer a comprehensive studio solution which blend easily into today’s production environment, integrating with all commonly used automation, traffic and studio control systems, all major switchers, cameras, lenses, tracking systems and more.